In most of the colleges, schools and offices social networking websites such as Facebook, Twitter, MySpace, Hi5 are maintained blocked due to some security issues. While some torrent sites are also blocked at some places. At that time you are not able to access blocked websites at school, college or office. 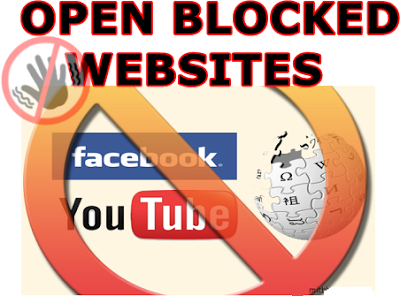 But don't to worry in today's article I will let you know how to open blocked websites with some easy to use and implement methods. Blocking of websites is becoming more and more powerful day by day using softwares. The reason is that there are lots of methods available to unblock restricted websites. Even a kid studying in school can unblock a blocked website at school. So management have found some other powerful methods to restrict social networking sites at school. But don't to worry there are still some ways which are ever green and will help you forever. This is the most reliable way to get onto blocked websites. First of all let me know you about what is proxies? These are servers through which you will connect when you access a blocked website. First of all information is sent to the proxy server, which then will send the data to you, circumventing the block. When you are not connected to a proxy server then you will directly connect to the site that you requested. At this situation if your Internet Service Provider(ISP) has blocked particular site for your IP then you won't be able to get passed blocked websites. But when you use proxy sites then these sites doesn't show your actual IP address thus you are able to access any restricted site. On requesting any website you will first connect to a proxy server then it will redirect you to the blocked site and thus you can open any blocked social networking website. There are hundreds of proxy sites available. You can search them on your favorite search engine by the term ("web proxy list"). But I have found some top and best working proxy sites list. These are the widely used proxy sites. Below is list of them. First of all go to any of the above mentioned proxy site. Almost each site has a field to enter blocked website URL, find it there and enter your blocked website there and hit enter. Wait for some seconds to load your website. It can take some time if your internet connection is slow because redirection process takes a little time. Thus you will be able to access blocked site. You might be trying now to open social networking websites using the above mentioned method. But I know it's not working. Look! there is not any error in the first method. you can easily access blocked static websites through proxy sites. But you won't be able to open social networking sites because these sites store cookies in your browser so you can't open them using proxy server. But don't worry here is an alternative to open them that is Tor Browser. Using tor browser you can surf anonymously. It is one the best tool available online to surf without knowing anyone. You can download on your laptop or PC using below link. It is one of the best and popular extension to open unblocked sites. It's available for almost all the major browser such as Google Chrome, Mozilla Firefox and much more. You can use this extension in your browser and surf anonymously. Check out there official website to download it. This is another one of the working method and easy-to-use. Whenever your school management wants to block any website then they simply enter the name of that particular website in some software which blocks site for your IP or in school, colleges and offices. But they have not blocked the IP address of that particular website rather they blocked the domain name. So you can have access to website by entering the IP address in your browser. But the problem is how to know IP address of any domain or website. It's one of the simplest work to do. The tool to know IP address is available in your laptop or PC that is cmd. Follow the steps below to find IP address. Press Window Key+R to open Run. Now type cmd and hit enter. Now enter ping example.com (enter blocked website instead of example.com) and press enter. It will show you the IP address of entered site, now enter this IP address in your browser and have fun. What if the IP address is also blocked by network administrator? Don't worry then also you can access blocked sites with decimal code. You might don't know one thing that each and every IP has its decimal code which we will use here in getting around blocked websites. I thought to write this method because it's rare that someone will block decimal code also. Simply follow the steps mentioned and go on websites that are blocked at school. First of all we will need the decimal code of particular code that you convert from IP address. Use This Software to convert decimal code from IP address. When you get the decimal code then simply enter it in your browser to get on blocked website. It is one of the simplest way to use. Google maintains a cache of each every website often. It simply means that it stores almost each and every site from time to time. But this is a boon for you because you can open blocked website using this. Go through the steps below. Now search for that particular blocked website on Google. After that you will see written Cached below the title of the website and in-front of URL of the site. Click on Cached and now you can see that website is opening. Sometime you will notice that the site which are trying to open is on http:// instead of https://. HTTPS is referred as secure connection. It simply means that the site which you are browsing is secure. This connection encrypts the data so it remains secure. Most of the webmaster are using https:// connection to secure their website. But you can use it to open blocked website. Instead of using http:// in front of blocked site try to use https:// and hit enter. For example you are trying to open a site example example.com on http connection like mentioned below. If it's not opening then just use secure connection that is https. It might solve your problem in just some clicks. These softwares let you browse anonymously. No one will be able to know your exact identity. There are lost of such type of tool available but I have found some best and working ones for you. Just download them and install on your system. After that you just need to select the another location instead of your current location. For example if you are from India then select the location other than India. It will simply change your current Indian IP to other location IP then you will be able to access any site. Below is a list of such softwares. VPN softwares comes in both mode that is free and PRO. If you are in a condition to pay then you can simply pay and purchase any VPN tool otherwise there are free version also available. I would recommend you to purchase a one if you face blockage problem often. Way Back Machine is way using which you can know about the previous look of any site. It contains archives through which web can know how a site was looking in previous. Just enter the address of blocked site here and then you will be able to access its previous version. This is one of the interesting method to use. You will get that blocked webpage on your email. After that yo can access it easily. Check out this website Web2mail for more details. This is one of the best method to use which works most of the time. If the proxy is on your own laptop or PC then it will be the safest method. In this method you will need a web server installed on your system on which you will install a proxy. Then you can connect easily as long as your system is on. the process of installing a web server is very simple. There are lots of web server software available but I will use WAMPServer in my guide. It is one of the best solution for Windows users. If you are a Mac user then you can use MAMP. First of all you will need to download and install WAMPServer on your system. Simply go to the official website and search there for this web server. When the installation process is complete, you will see its icon in the system tray in the right side at the end of your desktop. Right click on the icon and select "Put Online" to turn your server on. Then again right click and select "Localhost". Now if configuration page shows up then you have done all the steps correctly otherwise check for errors. Now you will need proxy server software. Here I am using PHProxy. It's free to use and you can download it from here. Extract the downloaded files and copy them to this location. Now you will need to test proxy. Open any web browser and enter this URL http://localhost/phproxy and hit enter. All worked fine if the PHProxy page appears. Now find your private IP address by enter ipconfig in command prompt and save it for further. Then open your router's configuration page in your browser and create a new rule for your server's private IP address. Remember that port 80 should be the range of ports and both TCP and UDP traffic are enabled. After that find your public IP which you can know by entering my IP in your favorite search engine. Now you can access from anywhere, to connect with PHProxy and use web interface, just enter PublicIP/PHProxy. Say your public IP is 101.14.36.78 then enter 101.14.36.78/phproxy in your browser. And That's it you will be able to open blocked sites. Note:- Use any of the above method on your own risk.